Many have never heard of Ultimate Frisbee as a sport, for the word Frisbee conjures up an image of a master and his dog. But the loving relationship that this playful game encapsulates is the same love that Ultimate as a CCA brings. If you have ever watched an Ultimate Frisbee match, you will know that it’s a display of passion, intensity and determination. 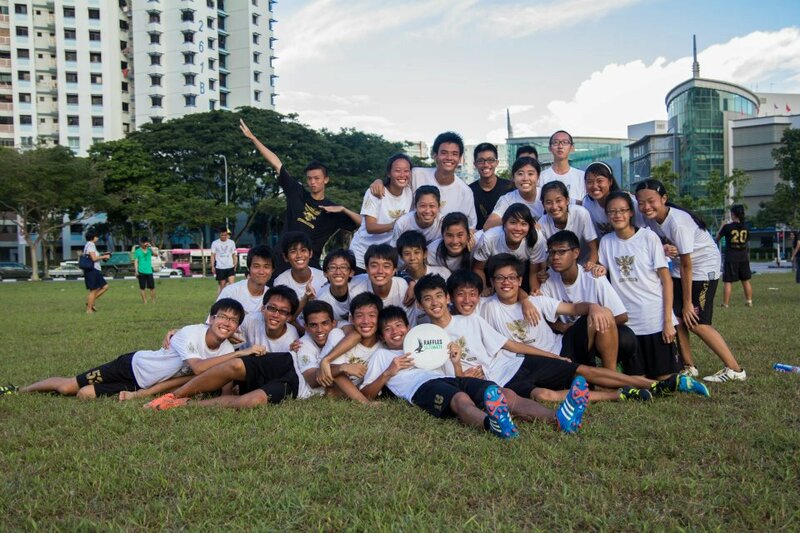 But in Raffles Ultimate, the real emotions aren’t just displayed on field They are ingrained into the hearts of the team- our love for our friends, love for the CCA and love for the game. In a sport that “[combines] the running of soccer with the stamina of hockey and the cutting, jumping and passing of basketball…” (The National Post, Canada), there cannot be an indispensable star player on the team. Everyone matters and has to be part of the game., As our coach, Benjamin Ho, puts it “Your mistake means the rest of the team running harder than ever to gain back possession of the disc”. In many sports, coaches tell you to believe in yourself. In Ultimate we believe in those who believe in us. In a game that pushes you to your physical and mental limits, one begins to doubt oneself many-a-time. But it’s the knowledge that your coach, your captain and your teammates, are behind you which keeps us going through the hardest times. But the love in Raffles Ultimate transcends our affection for our current teammates We are a family made out of generations of alumni who come back regularly to coach, to play or just to hang out. From bald smelly NS guys to well-dressed office workers, there are few trainings in which we don’t receive a surprise visit from an alumni. During the Inter-JC competition, seniors from years ago came back to support our teams, filling every available spot on the sidelines, making the Raffles sidelines the most filled . How many team sports end every game with a team huddle with both opponent teams together? How many team sports have players giving high-fives to everyone once the game ends? How many team sports have no referee but leave the players to make their own honest calls in game? This is the love for the game that is so uniquely Ultimate. In Raffles Ultimate, the sound of discs dropping in the amphitheatre and shouts of players in scrimmages are testaments to our love for the game. We spend many breaks and lunches down at the amphitheatre– throwing, scrimmaging, doing what we love best, and rushing back to class dripping with sweat. Friends frequently mention our frequent disappearances and sweaty appearances, but that doesn’t stop us. It’s our way of life. So if you ever walk down the halls of science block and hear shouts from the amphitheatre, we sincerely apologise in advance. The true love of Ultimate can never be silent.